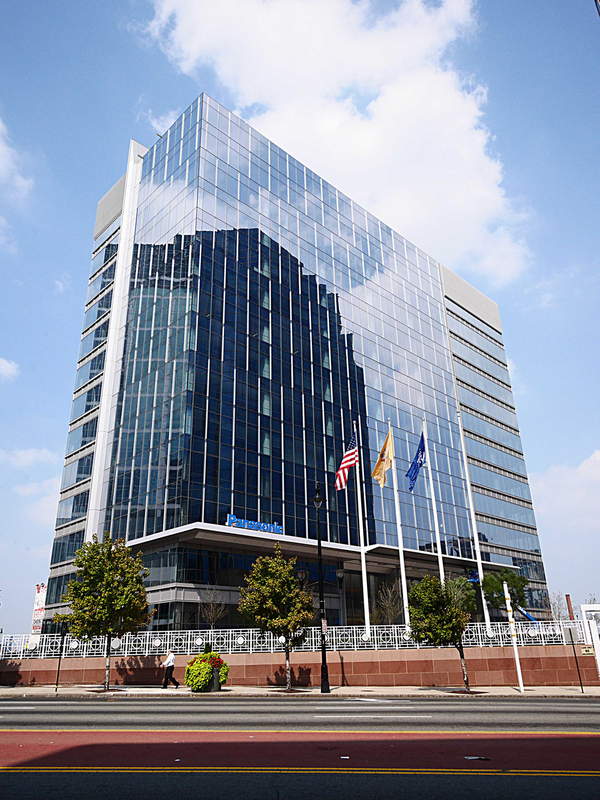 Now located in the Business District of Newark, NJ, the 12-story Two Riverfront Plaza is adjacent to Newark Penn Station, allowing for more commuting options for Panasonic employees. More than 40% of employees now use mass transit to commute to work (up from 5% at the previous facility), and Panasonic hopes that number will grow to 80% as employees become more comfortable in the new space and get used to life on the rail. Aside from the “green” appeal of Newark, the choice to relocate to a growing urban environment was also important for Panasonic. It is a community that can benefit from a large corporation’s continued support and involvement. Prior to the move, Panasonic participated in many park clean-ups in and around Newark. On the last day of Newark’s annual Cherry Blossom Festival at Branch Brook Park, Panasonic brought a large group of people to help clean-up the park and kick-off the company’s sponsorship of a new educational gaming app, which aims to teach children about being financially responsibly, while being eco-responsible, as well. Design strategies for the building incorporated various sustainable and “wellness” elements in an effort to achieve LEED Platinum certification for the interior and LEED Gold certification for the exterior. (The former is pending and the latter was achieved earlier this year.) For example, the building targets a 37% water savings from the baseline established by the EPA by incorporating low-flow fixtures in restrooms, pantries and the café. Daylight harvesting controls have been incorporated into the building to reduce the lighting load when natural daylight meets appropriate levels. Panasonic has even found a way to generate their own electricity by including 235W HIT photovoltaic solar panels on the roof. 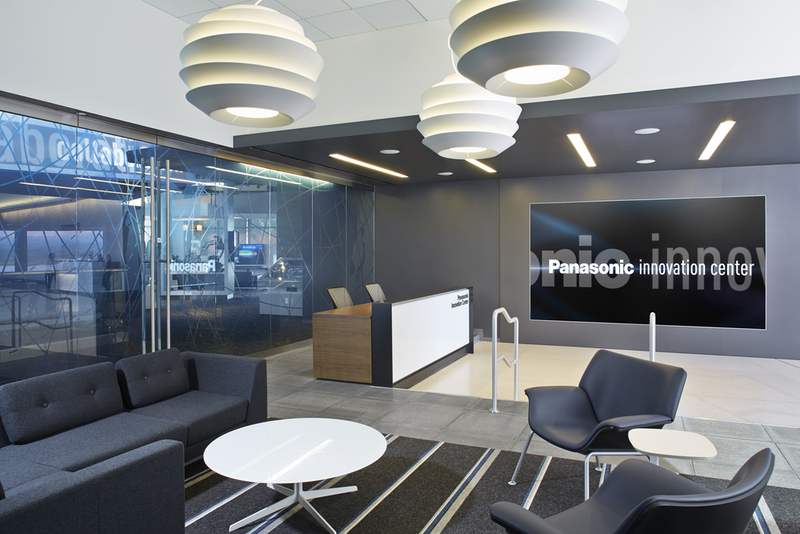 Housed within Panasonic’s new headquarters lobby is the Panasonic Innovation Center, which serves as a tool to educate guests and the community on the different product solutions that Panasonic offers and the green innovations that the company is achieving. 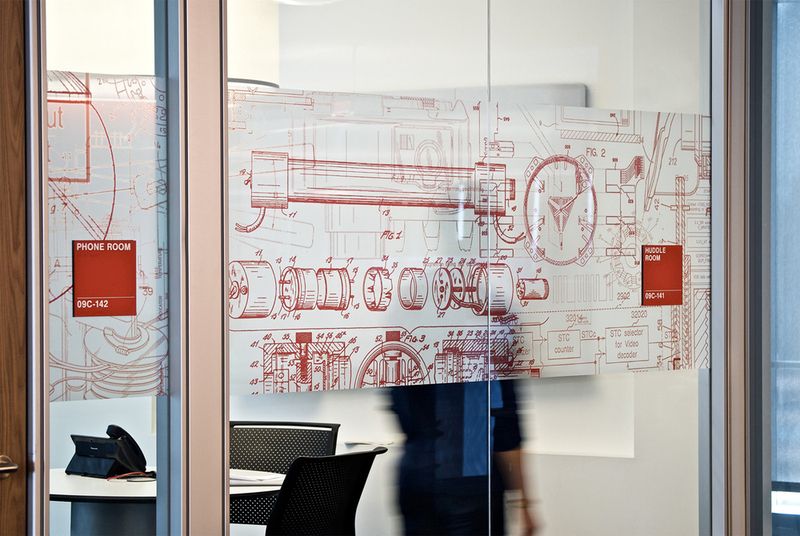 In a dynamic, interactive space, the Innovation Center showcases the company’s latest technologies, vision and heritage. The center includes a 3-D theater and displays green technology solutions, including those for the home and for industrial, avionic and automotive application. It was also important to Panasonic to create a more inviting work environment for employees. A new open floor plan now provides over 90% of employees with window views and access to natural sunlight. The new workplace strategy and space standards are indicative of a paradigm shift within Panasonic, from a primarily closed office plan to a collaborative, open workplace environment. (At the previous location, 40% of the workspace was dedicated to closed offices; now just 7% is enclosed.) In addition, personal workstations have been installed with the latest in ergonomic design, from chairs to individually controlled task lighting, providing optimal comfort for employees, while encouraging collaboration and teamwork. 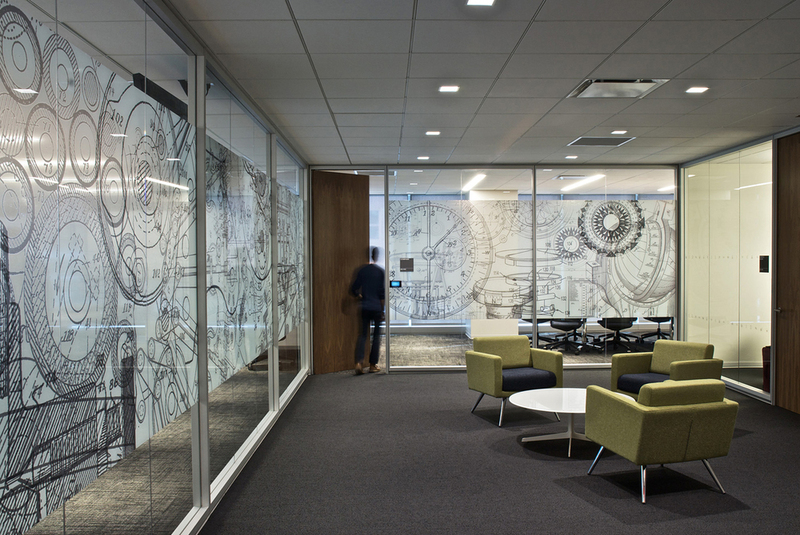 “Panasonic’s design strategy required a deeply interactive process, one that delved into the qualitative as well as the quantitative components of the client’s vision and established the project’s guiding principles,” says Kimberly Sacramone, project design principal and Managing Director of the HLW New Jersey Office. “That’s what sets our approach apart." HLW’s discovery and sustainable services are fundamentally linked to HLW’s design process. HLW provided the following services: Strategic Planning, Programming, Interior Architecture, LEED Consulting. Panasonic was recently featured on Business Insider. In this last post, the third of a total of three articles focused on an in-depth discussion about the design process resulting in the new UNIQLO North American Headquarters, we will explore more conceptual themes that guided the decision-making process. A critical challenge for HLW was to create an office that reflects the UNIQLO brand, design and culture through a simple, yet universal, aesthetic. The identification of several guiding ideas ensured that the design would maintain cultural consistency with our client’s organization, mission and business objectives. This year, HLW is celebrating its 130th year of continuous practice. On occasion, we will be highlighting the firm’s contributions to New York City’s skyline—and far, far beyond on a global stage. Today, we bring you a story of innovation that is over a century in the making.